At MJL Decorating Services, we draw upon more than 33 years of experience to produce exceptional hand-painted kitchens. 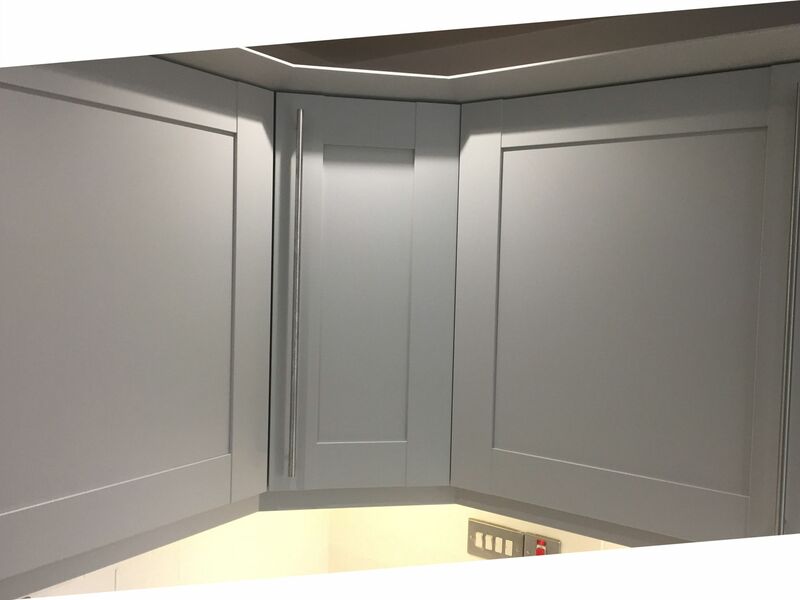 Based in Southampton, Hampshire, our team creates painted kitchen cabinets that add colour and character to your home. 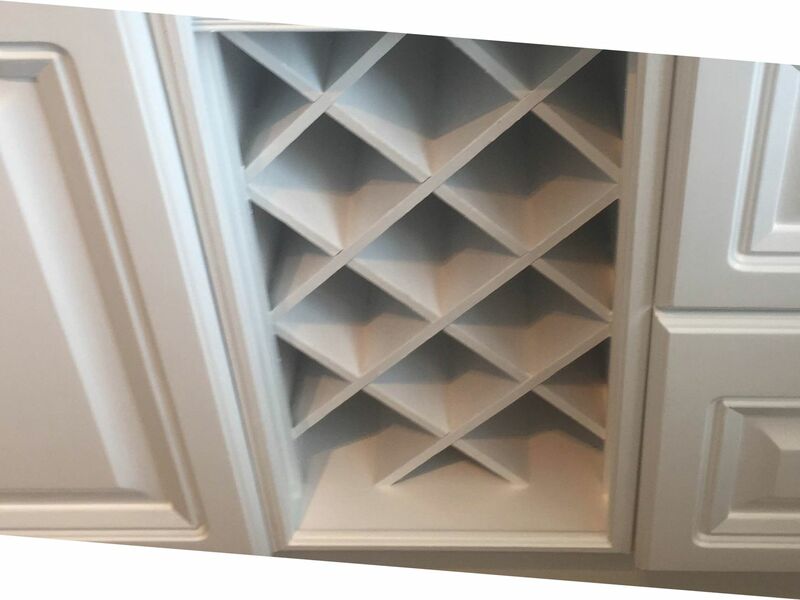 At the start of a hand-painted kitchen project, our team will begin by removing all of the handles in your kitchen. Then, they’ll thoroughly clean them before sanitising and de-greasing all doors and draws. To do this, we use Krudcutter Original™, a fabulous and eco-friendly product that is available online. In our opinion, this product is far superior to sugar soap, which we no longer make use of. Once everything has been cleaned and wiped down with a damp cloth, we’ll mask the worktops using lining paper and various tapes. Then, we’ll lay protective Correx™ on top of existing worktops and flooring. This is a durable, spill-proof, and impact-resistant protective board. When the entire kitchen has been spotlessly cleaned and de-greased, the sanding can begin. 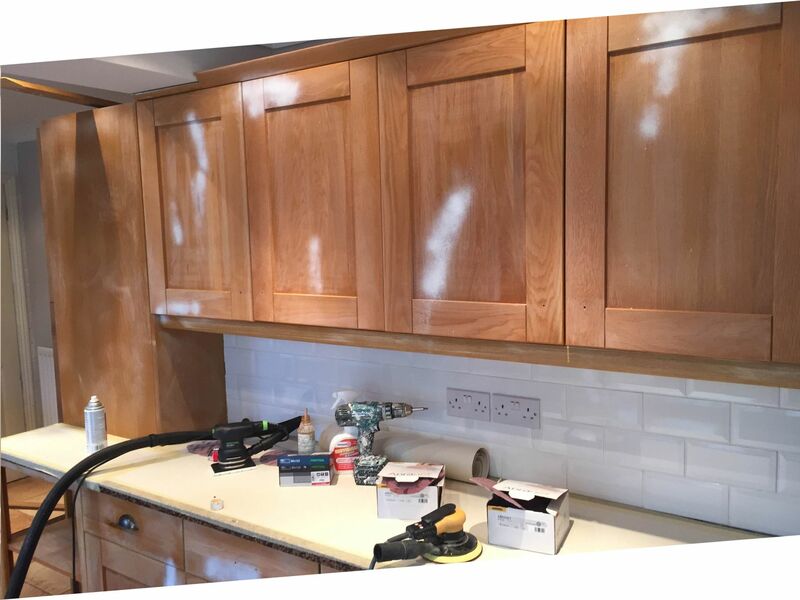 Every part of the kitchen will be thoroughly sanded, making it suitable for subsequent coats of paint. When corners are cut in the cleaning or sanding stages, paint will fail to adhere and will start to chip or peel. That’s why our team spends the majority of their time in these crucial early stages. At MJL Decorating Services, we’ve never encountered issues with peeling or flaking paint. That’s because we take the time needed to thoroughly clean and prepare your surfaces before moving forward. To sand surfaces, we utilise professional sanding tools. These tools feature dust extraction, making the process virtually dust-free. Specifically, we make use of a Mirka™ Ceros which is connected to a Mirka hoover. This automatically activates to eliminate dust as it is produced by our Abranet sanding discs. In addition, we use a Festool™ RTS 400 Q-Plus GB 240V orbital sander. Small in size, this tool is perfect for reaching corners and the flat sections of kitchen units and trims. Contact us today, in Southampton, Hampshire, to enjoy the splendour of the hand-painted kitchens and painted kitchen cabinets we produce. Next, our team will apply high-adhesion primer to surfaces. Our preferred product is Otex™, which is manufactured by Tikkurilla™. This fantastic primer can often be tinted to match the colour of the top coat, ensuring maximum coverage and colour depth. At MJL Decorating Services, we prefer to use this product as it is a tried-and-tested solution, renowned for its finish, colour accuracy, and longevity. 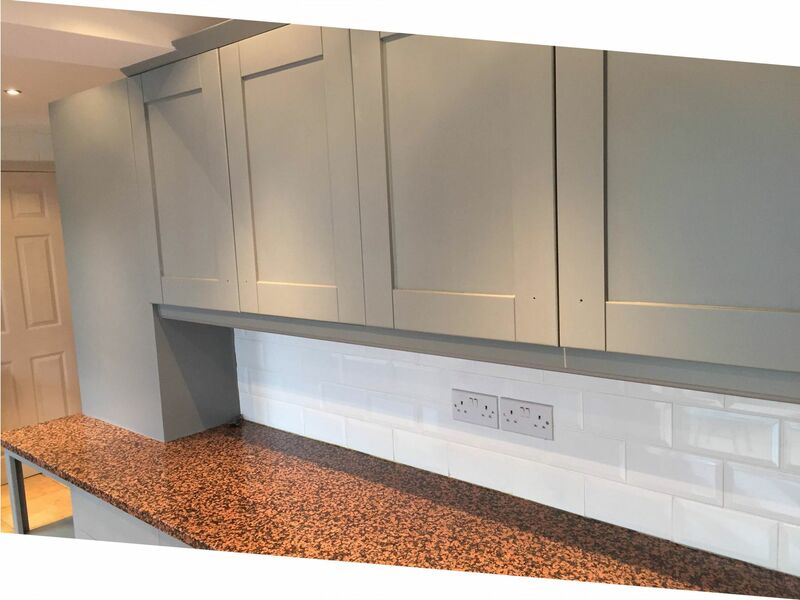 Tikkurilla may not be widely known in England, but trust us when we say they are the best on the market for hand-painted kitchens and furniture. The primer is arguably the most important coat in the entire process. If not applied correctly, heavy brush marks will show through and ruin the appearance of the top coat. Applying the top coat is an easy process if the primer has been applied neatly and evenly. Our team always applies at least 2 top coats of your chosen colour. Tikkurila Helmi ™ is our preferred range, as it is extremely durable paint and is available in three finishes: matt, semi-matt, and gloss. In this last stage, the effort spent cleaning and preparing will finally come to fruition. Using techniques honed throughout years of experience, and plenty of patience, the final applications will transform the look of your kitchen entirely. However, our work doesn’t have to stop in the kitchen: skilled decorating services are available for every room in the house.